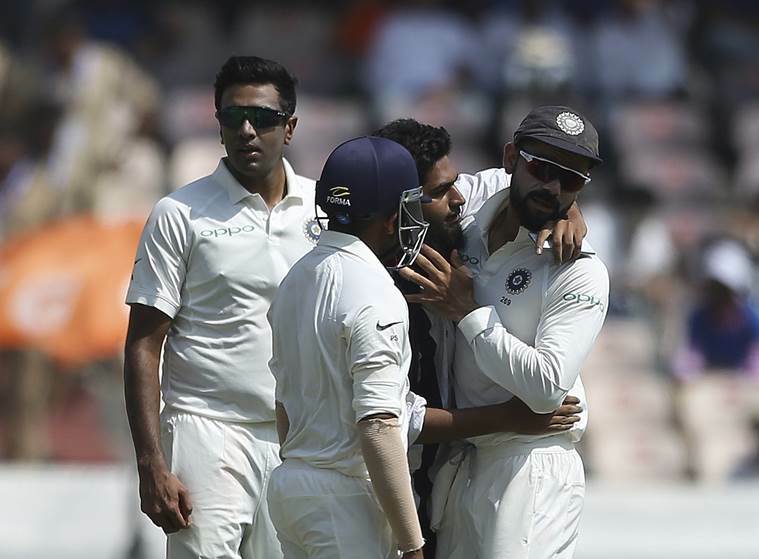 India vs West Indies 2nd Test Day 1 Highlights: Roston Chase remained unbeaten on 98 and skipper Jason Holder scored a half century as West Indies showed their resistance in the final session. 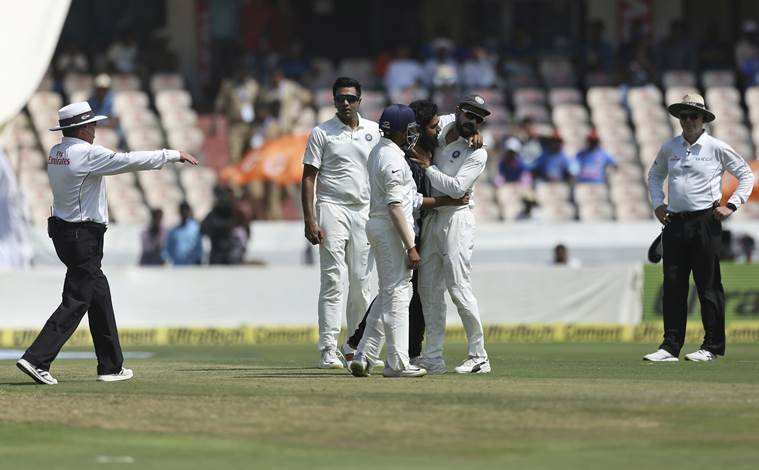 India vs West Indies 2nd Test Day 1 Highlights: With Kuldeep Yadav striking twice early in the second session to send Shimron Hetmyer and Sunil Ambris back to the hut, West Indies were struggling at 113/5 at one stage. But from then on, they managed to lift themselves to reach 295/7 at stumps on Day 1. Roston Chase and Shane Dowrich added 69 runs together before Umesh Yadav dismissed the latter. Skipper Jason Holder departed for 52. But Chase remained unbeaten on 98* and batted throughout the day. 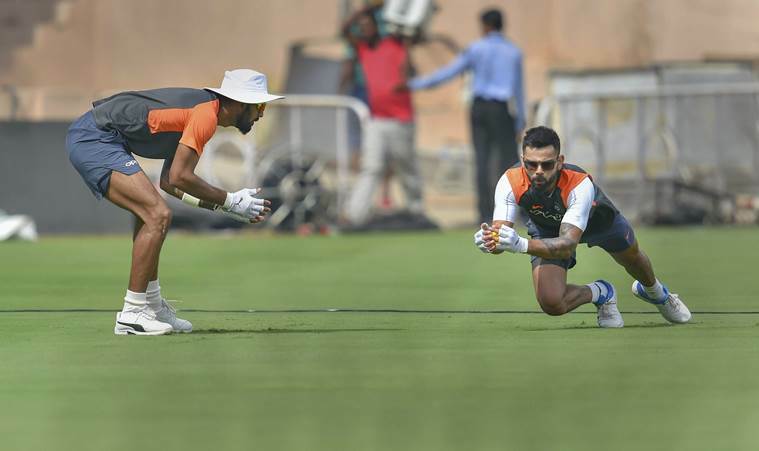 Catch Live score and updates of India vs West Indies 2nd Test Day 1 at Hyderabad. West Indies reach 295/7 at Stumps. After a solid fight back, they have been able to lift themselves from 113/5 to 295/7 on Day1. India have taken the new ball and it is Umesh Yadav who will have the first go with it. Remember, India do not have another seam option as Shardul Thakur is out of action for today. Roston Chase and Jason Holder have taken West Indies over 250. This is now the longest West Indies have batted against India in last 7 innings in India. Meanwhile, India have the option to take new ball now. R Ashwin and Kuldeep Yadav are in the middle for India. The duo are bowling in the middle but so far, they have not been able to get a wicket here. Chase survives a LBW appeal and India call for review. But the replays went in Chase's favour. India lose their first review. West Indies off to a good start in the final session of the day. With Roston Chase and Jason Holder in the middle, the visitors cross over 200-run mark. Play resumes after tea with Umesh. The final session of the day begins with West Indies notching up 200 runs. Ravindra Jadeja out to bowl the final over of the session. Can he pick up a wicket? Nope, he does not. West Indies reach 197/6 at Tea. FIFTY FOR ROSTON CHASE! He has put on a good fight here after two early dismissals in the session to reach his 7th Test half century. Umesh Yadav comes out to replace R Ashwin. He picked up a wicket just before the end of the first session. Can he do the same before Tea? India have bowled at an over rate of 17.2 in this session. They have bowled 26.3 overs and have given away 89 runs and picked up only two wickets. This session is slowly steering Windies' way. Shane Dowrich and Roston Chase have built a 50-run partnership for the 6th wicket. The two are leading Windies resistance at the moment. Ravindra Jadeja returns to the attack and he replaces Kuldeep Yadav. He would be hoping the change of end would do the trick for him. FOUR! Ashwin strays off the line and gets deservedly punished. Shane Dowrich stretches his arms and guides it for a boundary through covers. With Ravindra Jadeja proving to be a tad bit expensive, skipper Kohli calls in R Ashwin to replace him. West Indies have a good partnership building onbetween Chase and Dowrich, and Kohli is keen to get a breakthrough. West Indies needed two batsmen to stick their heads together and take them out of the muddle. Roston Chase and Shane Dowrich have done exactly that. The duo have counter-attacked and have added 35 runs together. Update: Shardul Thakur has gone for scans. He will not take the field today. An update on his participation for the rest of the Test will be taken after looking at the scans and after being assessed by the team management. IN THE AIR... JUST SHORT OF UMESH YADAV! Slow delivery from Kuldeep Yadav and Sunil Ambris slog sweeped it to square. The ball was in the air but it just dropped short of a diving Umesh Yadav. Missed opportunity. 100 up for West Indies! FOUR! Swing from Umesh Yadav but he has pitched it right where Roston Chase likes the ball to be. He just flicks it towards square for a boundary. Brings up 100 for West Indies. Kuldeep Yadav gets a direct hit with Roston Chase running towards the wrong end. The umpire called for the TV review but the replays showed he was well inside the crease. Umesh Yadav continues the attack. He still has 3 balls left in the over. Shimron Hetmyer has been joined by Sunil Ambrys in the middle. BACK LIVE! 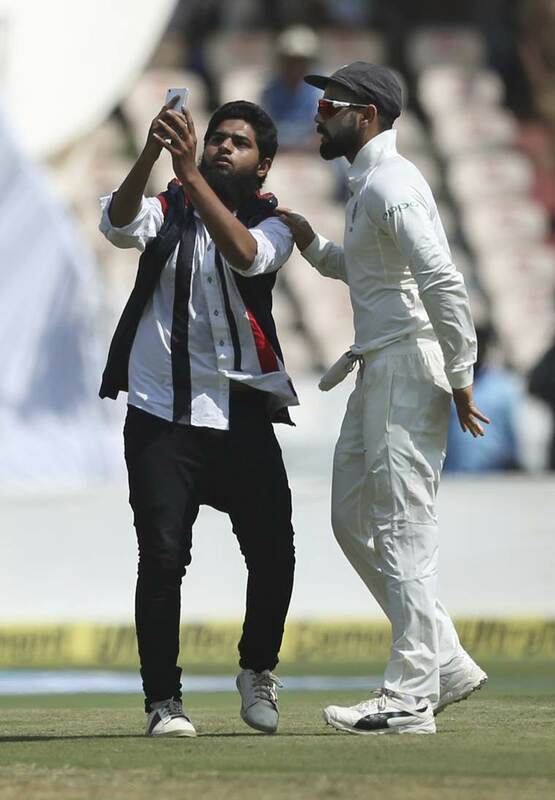 A fan invades field once again to click selfies with Virat Kohli. WICKET! Umesh Yadav strikes and he has wrapped Shai Hope on the pads. It seems to be hitting the leg stump. Hope calls for review. Another review wasted by West Indies. That was clearly hitting the stu,ps. And that would be Lunch. West Indies 86/3 at Lunch. Umesh Yadav traps Shai Hope on the pads just before Lunch. Huge appeal from Umesh. The umpire did not seem interested. India call for a review. 3rd Check: Pitched in Line. Impact in Line. Height - Umpire's Call. Jadeja comes into the attack to replace Kuldeep Yadav just before Lunch. He has been punished so far by Shimron Hetmyer and Shai Hope. Gives away 9 runs in the over. Umesh Yadav has really struggled with his lines in the match so far. He has offered plenty of width on short deliveries and he has been derservedly punished. Umesh Yadav replaces R Ashwin into the attack. India are looking for a seamer in action just before Lunch, but Shardul's absence is hurting them. Maybe, they should have gone for Shami? WICKET! Kraigg Brathwaite departs as he fails to pick up the leg-spin from Kuldeep and the ball just went on to hit his back pad. It looks plumb. There was no nick from it. Brathwaite CALLS FOR A REVIEW! WHAT A CHANCE! Kuldeep once again manages to get a nick of Brathwaite and the ball just falls short of Ajinkya Rahane at slips. BEAUTY! Ashwin has really crammed up Kraigg Brathwaite for room. Pitched it full and leaves no space for Brathwaite to get any touch on it. He almost did and got caught. For those, who have missed the first hour, here is a friendly reminder: Shardul Thakur, who received the maiden Test cap, stayed only for 1.4 overs before he had to walk back due to pain in the right groin region. He is still not on the field. 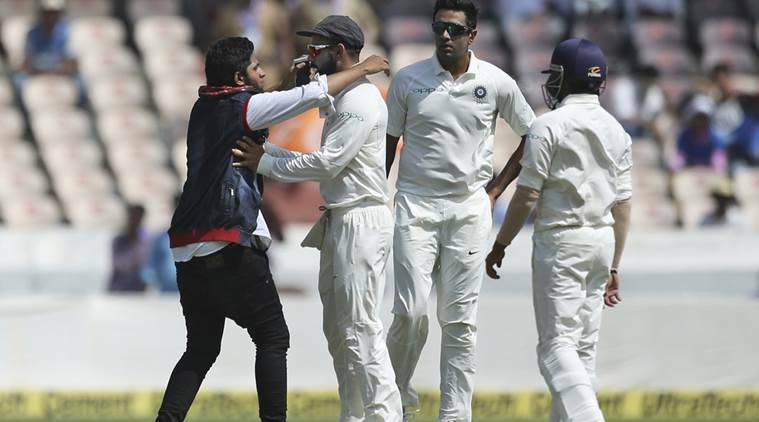 Pitch invasion by fan wanting selfie with Kohli has caused a drinks break here in Hyderabad. This is the second time such incident has occurred in this series. Also happened in first Test in Rajkot. Kraigg Brathwaite gets a leading edge and the ball almost travelled to Virat Kohli at slips. Kuldeep Yadav is troubling the batsmen early on. Time for Umesh Yadav to take a bit of a breather and here comes Kuldeep Yadav. Now it will be spin from both hands. New man in and Kohli wants his wrist spinner to settle down before attacking. Smart.